In 1878 Horatio Walker moved from Ontario to New York. In 1881 he traveled to Europe, where his work was much influenced by the Barbizon painter Jean-François Millet, then returned to New York. By 1907, Walker was the most famous Canadian painter of the time, and since he had a New York dealer, his works were acquired by many major American collections. However, Walker kept his ties to Canada, acquiring a summer home on Île d'Orléans near Quebec City, which became his permanent home in 1915. It was a measure of Walker's success that one of the first major acquisitions of the National Gallery of Canada was his painting Oxen Drinking, for which the gallery paid $10,000 in 1911 - a considerable amount at that time. Walker was a founding member of the Canadian Art Club, an important early artists’ group, and became its president in 1915. He was renowned for his pastoral scenes portraying habitant life in the Quebec countryside, such as this fine painting. 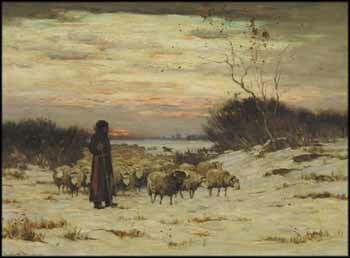 Walker's mastery of atmosphere is clear in the stunning sunset effects and the luminous winter light that bathes the shepherd and his flock.